Baby, it’s cold outside and I’m a firm believer in hot soups when the weather is frightful. I love a good tortilla soup but most of them have way too many tomatoes cooked down where I can’t pick them out. Allergy, so this is a thing with me. When I came across this recipe, my brain automatically started making substitutions. I tried it last week and the recipe got two thumbs up from Lawyer Guy and a thumbs up from me. Subs are mentioned below in the recipe. 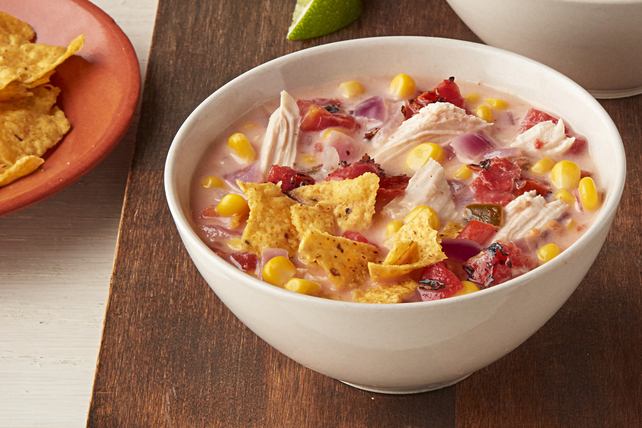 Warm up with a delicious bowl of Creamy Chicken-Tortilla Soup. This Creamy Chicken-Tortilla Soup is full of amazing Tex-Mex flavors everyone loves. 1/2 cup crushed tortilla chips (I used blue corn tortilla chips and served them on the side so they could be crunched “individually” because I don’t like mushy chips in my soup. Heat oil in large saucepan on medium heat. Add onions; cook 5 to 6 min. or until crisp-tender, stirring frequently. Add tomatoes, corn, chicken broth and hot sauce; mix well. Bring to boil; simmer on medium-low heat 15 min., stirring occasionally. Add chicken, VELVEETA and lime juice; cook on medium heat 5 min. or until VELVEETA is completely melted, stirring occasionally. Serve topped with crushed chips. We like things really spicy around here, which is why I added the chopped green chilis. If you aren’t a fan of SPICY spice/hot, you can ease the heat level by using mild or medium hot taco sauce instead of the hot taco sauce. I served this up in large soup “mugs” so I’m pretty sure there was probably at least 2 cups in each serving. We did have leftovers so I froze what was left and defrosted then heated the servings in the microwave. It worked just fine. Want full nutritional information? CLICK HERE. This was an easy soup to make, though I did have to go shopping for the ingredients. Well worth it! I hope you enjoy if you give it a try. Leigh Daniels, the heroine in NIGHT FIRE, likes to play with hot stuff–like her hero, Nightrider nomad and Wolf shifter, Smoke Jenner. As an arson investigator, Leigh is used to firehouse food and while a lot of firefighters are known for their 5-Alarm Chili, Leigh is known for her cheesy tortilla soup. Smoke agrees. This entry was posted in Writing Life and tagged characters, food, links, Nightriders MC, recipe, Tuesday Treats. Bookmark the permalink.